Is Tuukka Rask as good at tennis as he is at hockey? Many members of the Boston Bruins have interesting hobbies outside of hockey. Zdeno Chara, for example, is an avid bicyclist and has ridden some of the stages of the Tour De France just for fun. It seems Tuukka Rask also has a secondary favorite sport he turns to in the offseason, but his pick is a bit more conventional: tennis. Rask, who made a trip to Wimbledon over the summer, told SportsNet in a recent Q&A that he plays tennis four or five times a week as a way to enjoy training in the offseason months. 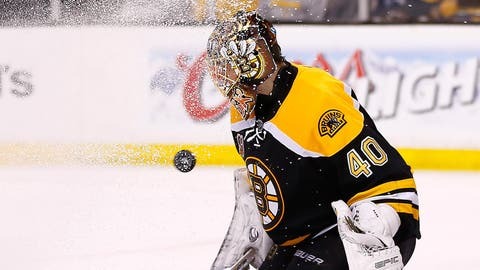 Rask revealed that, like goaltending, tennis involves plenty of hand-eye coordination and strong footwork, so he said his frequent matches are a fun way to get in a good workout. Considering Rask has won a Vezina as the best goaltender in the NHL in 2013-14, it seems like that summer tennis paid off.